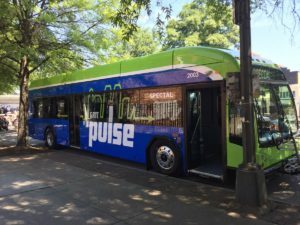 Last month, GRTC launched its new Pulse Bus Rapid Transit (BRT) service. This high capacity rapid transit system serves a 7.6-mile route along Broad Street and Main Street, from Rocketts Landing to Willow Lawn. In addition to the new dedicated BRT lane, GRTC has also redesigned the entire bus route network, leading to more accessible service for RVA residents. Over the first four days of service, the Pulse saw nearly 31,000 riders – far exceeding the expected ridership numbers. With the successful launch of the Pulse, we wanted to take another look at some of our indicator data in the Coordinated Transportation priority area. Richmond is the 42nd largest metropolitan area by employment with 639,299 jobs. Over the last year, RVA has seen a 4% increase in accessibility to those jobs, and according to the University of Minnesota, Center for Transportation Studies, Richmond actually does a relatively good job getting residents to jobs by transit that are within a 10 minute commute. However, the longer the commute, the lower Richmond is ranked. For commutes that are 60 minutes or more, Richmond ranks near the bottom of the top 50 metros at number 47. What this indicates is that as you get farther away from the central business district, you have fewer and fewer transit options. Currently, the top 50 metro areas spend on average approximately $127 million on transit – RVA spends only about $48 million. 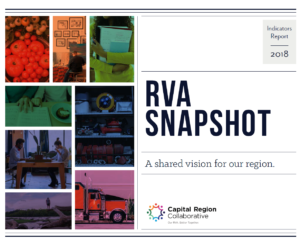 With ridership at around 8 million annually, there is an immense opportunity to establish a dedicated funding source that links the city and its surrounding counties with a system that connects people with jobs and drives economic development.